A diet containing unsaturated fats — as found in olive oil and walnuts — showed similar weight loss effects as a lower fat, higher carbohydrate diet, according to a study published in the Journal of the American heart Association. The study also found a diet containing walnuts, and mostly comprised of polyunsaturated fats, had a beneficial effect on cardiovascular markers such as cholesterol. Dr. Cheryl Rock, from the University of California, San Diego School of Medicine, and colleagues evaluated 245 overweight and obese women ages 22–72 years old who were enrolled in a 1-year behavioral weight loss intervention. Study participants were randomized to 3 different diets: a lower fat + higher carbohydrate diet; a lower carbohydrate + higher fat diet; or a walnut-rich (1.5oz/day) + higher fat + lower carbohydrate diet. Data from the first 6 months of intervention showed an average weight loss of almost 8% of initial weight across all groups. Study participants in the walnut-rich diet arm saw similar weight loss to the other study arms but had the most improvement in lipid levels especially in those who were insulin-resistant. They saw a significant reduction in LDL cholesterol as well as a greater increase in HDL cholesterol vs. the other diet arms. 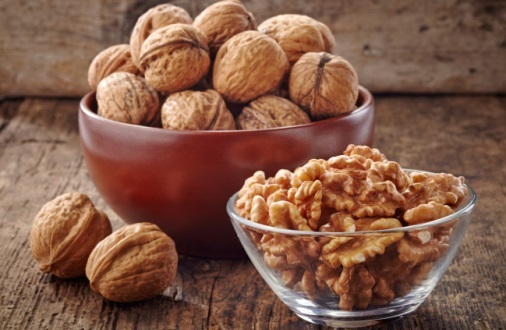 Study participants in the lower carbohydrate + higher fat diet participants were encouraged to consume foods higher in monounsaturated fats; the walnut-rich diet offered a greater source of polyunsaturated fats. Dr. Rock noted that some study limitations include a women-only sample, lack of detailed information on dietary intake and diet adherence, as well as a reduced sample size for comparison due to the subgroups. A separate study conducted by Harvard researchers showed that people who replace saturated fats with polyunsaturated fats may live longer and have a reduced risk of heart disease. The 2015–2020 Dietary Guidelines also recommended consuming polyunsaturated fats as a replacement for saturated fats.